The game-changing discovery of photovoltaic perovskites has heralded a new generation in photovoltaic technology. Now, their future commercial exploitation might benefit a substantial acceleration based on a robust, cost-effective, and high- throughput deposition that concurrently is less environmentally constraining compared to most archetypical fabrications. There is no denying it: the exclusion of fossil fuels is approaching. As our human dependency on these greenhouse-gas-producing resources is forced to come to an end, sustainable energy sources are gaining immense prominence to fill the future energy gap. In the past 20 years, considerable interest has been shown in solar energy, holding true promise as an inexhaustible and affordable source of sustainable energy. Yet, still too expensive for the average consumer, the large-scale implementation of solar is still on the rise, with room for vast improvements. 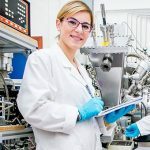 The game-changing discovery of a new generation of photovoltaic materials, however, is reshaping the face of photovoltaics and might give solar the push it needs. Boosting the solar industry with tremendous enthusiasm, metal halide perovskites are skyrocketing in terms of performance in just less than 10 years of intensive global research. Currently holding a record lab performance of 23.3% — on par with established and alternative commercial technologies such as multicrystalline silicon, CdTe, and CIGS— this thin film technology has heralded a new era in photovoltaics. Not too far off from the mighty single crystalline silicon powerhouse at an efficiency of 26.6%, the large-scale exploitation of this novel materials class is considered an approaching reality, despite several key challenges that still have to be addressed. 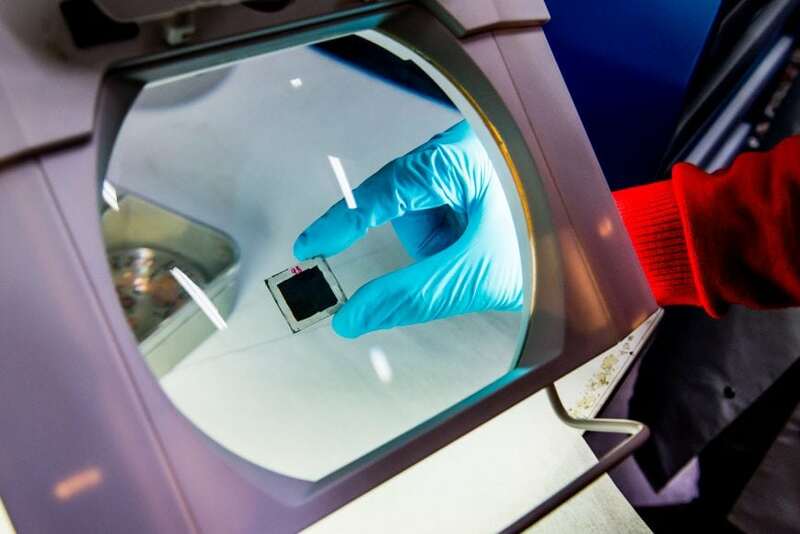 Allowing for a rapid, high throughput, and low-cost solution-based deposition of the active layer, one major hurdle to overcome in up-scaling perovskite technology is the achievement of high-quality thin films. As the morphology and crystallinity of the light harvester govern its favorable material properties, the development of a reliable and efficient film formation strategy is becoming extremely relevant if the technology is to succeed. A plethora of deposition strategies are reported in the literature; nevertheless, many remain optimized specifically for one lab and, in many cases, just for one perovskite composition. As a consequence, these optimized strategies that are indirect routes based on a still growing body of knowledge, typically result in poor inter- and intra-laboratory reproducibility. The issue is hardly mitigated upon variation of the device architecture and switching to promising — yet compositionally more challenging — perovskites that require different and more rigorously optimized deposition conditions. As upscaling would add to each of these difficulties, thereby limiting the technology’s vast potential, a pressing need has been expressed for a universal deposition that can benefit the photovoltaic community as well as lower the threshold for a researcher from other related fields to enter this inspiring research domain. In the most archetypical deposition, a wet precursor film is deposited from solution, and thereafter quenched with a large amount of anti-solvent to expedite the crystallization to form a superior absorber. Typical anti-solvents are chlorobenzene, toluene, and ether, all well-known liquids from the painting, rubber, and pharmaceutical industries. However, a critical complication upon using the classical technique to fabricate these films is that the quenching window is rather precise in order to obtain highly-efficient perovskites. Along with environmental parameters that additionally affect the crystallization process, and are hard to control, the latter makes the classical method tedious and hard to successfully repeat for even samples processed in the same run. Meantime, the universal deposition, which employs a gas to quench the wet precursor film, offers a less stringent quenching window as compared to the classical deposition. Depending on the type of perovskite, this gas can either be an inert gas such as argon or nitrogen, or even air in case of the commercially relevant robust compositions. Thereby significantly relaxing the fabrication conditions of these promising harvesters, the methods also demonstrates increased reproducibility with a low standard deviation (σ<1) for a wide diversity of perovskite compositions. The lab-scale gas quenching translates well to industrial air-assisted drying mechanisms. Being a well-established technique that is rigorously employed in industrial processes on conveyor systems by means of an air blade, the high-intensity and uniform sheet of laminar airflow can also serve the purpose of drying the wet perovskite precursor film on large areas and promote uniform crystallization. Offering the additional benefit of lowering the environmental constraints by the elimination of an additional (anti-) solvent in the production chain, the one-on-one reproducibility of gas quenching and applicability over a diverse range of perovskite compositions makes it an excellent method for the large-scale roll-to-roll deposition of photovoltaic perovskites. 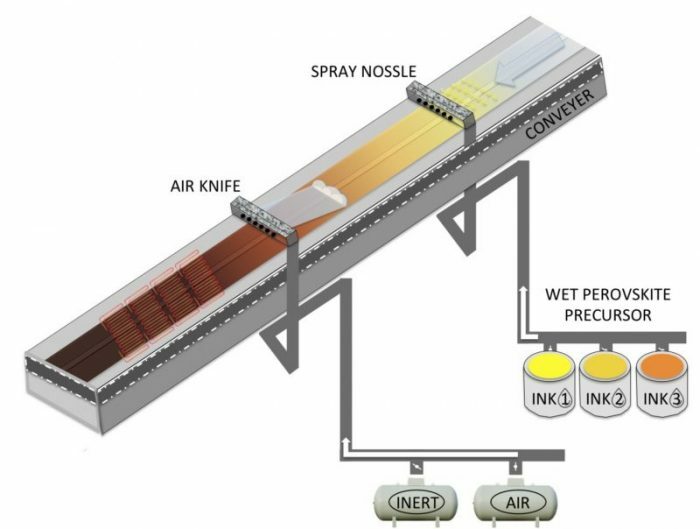 Distributing the wet precursor by means of established coating techniques (such as blade coating, slot dye coating, ink-jet printing, and many more) fused with an air blade, the large-scale application of gas quenching can easily be integrated into a production line for perovskite photovoltaics. These findings are described in the article entitled Gas Quenching for Perovskite Thin Film Deposition, recently published in the journal Joule. This work was conducted by Aslihan Babayigit, Jan D’Haen, Hans-Gerd Boyen, and Bert Conings from Hasselt University. Aslihan is a PhD Fellow of Research Fund Flanders (FWO), Institute for Materials Research - IMEC, UHasselt, BE.